The Palestinian Prisoners’ Society (PPS) has reported that Israeli soldiers abducted, on Monday at dawn, at least five Palestinians in Bethlehem, Tulkarem and Jenin, in the occupied West Bank. The PPS said the soldiers stormed and violently searched many homes in the invaded communities, interrogated several Palestinians and abducted five. It stated that the soldiers abducted Khaled Fawwaz Salah, 27, from his home in the al-Khader town, south of Bethlehem, and added that the Palestinian was preparing for his wedding, scheduled for this coming Thursday. In addition, the soldiers abducted Samer Bassel Salama, after invading his home in the Thannaba area, east of the northern West Bank city of Tulkarem. 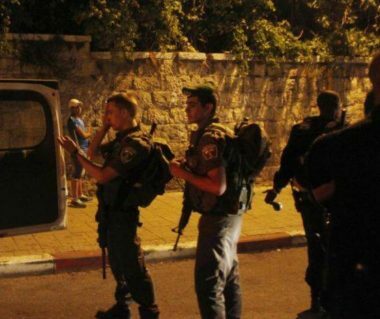 Furthermore, the soldiers searched dozens of homes in Jenin city, Jenin refugee camp, Faqqu’a’ and al-Jadeeda villages, in the northern West Bank governorate of Jenin, and interrogated many Palestinians. The soldiers abducted Nayef Turkman, from his home in the Zahra’ Street, in Jenin refugee camp, in addition to Jawad Rassem Khatib and Samer Salama, from Faqqu’a village, east of Jenin.